One of Nepal's most famous religious places of Shamanism pilgrimage is Gosainkunda lake, situated at an altitude of about 4312 m.
Rajesh Lama, but to his friends he is just “Lama”. Born in Kavre district of Nepal. Lama spends most of his time out trekking, rock climbing, mountain biking. 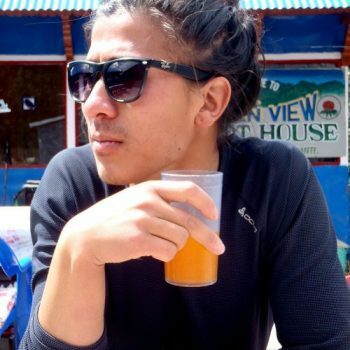 He also has a band “The Boyz Next Door” who can be seen playing live gigs around Kathmandu. Surrounded by high mountains on the north and east, this lake is grand and picturesque. Every year during full moon in August, thousands of Hindu pilgrims and Shamans come here for pilgrimage and it is quite an experience. If you are willing to go outside your comfort zone, the Shamanism Trek provides a unique opportunity to immerse yourself in one of the best cross cultural, multi religious events, which is still free of heavy tourist traffic in the world. The highlight of this trek is the Gosainkunda Lake, famous because in the August Full Moon Shamans come here from all parts of Nepal for a full moon festival. It is the a graduation ceremony for shamans, as apprentice shamans show their skills to their teachers so that they can be certified as full shamans. This trek is a perfect introduction to the rich cultural heritage and the amazing treks that Nepal offers. One of the shortest treks possible and the only that starts right in the edge of the Kathmandu Valley, this trek takes you through striking landscape as we trek on a north south ridge towards the Langtang Valley, the third most famous trekking destination in Nepal. Along the way, we pass simple villages of different ethnic groups with their rich culture. A few days into the trek and as we cross altitudes in excess of 3400m, we start coming into alpine area with spectacular views. By Nepal’s trekking standards this is a relatively moderate trek in physicality, however since this trek takes place during monsoon season it will be at times cold, wet, slippery, foggy, congested, and loud because of drumming shaman and singing Hindu and Buddhist pilgrims. But the greenery is at its best and since it is not peak season, it is best for people who do not want to be part of the crowd. The contagious endearing kindness of the Nepalese who trek along side you. The inspiring spiritual devotion, strength of will, and positive energy of those who make this trek every year. 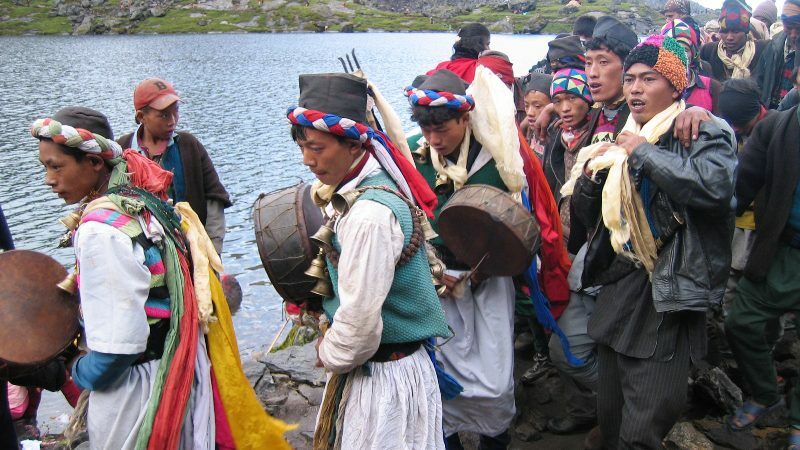 An unparalleled mix of Shamanism, Hinduism, and Buddhism fused into one as thousands meet to pray, sing, dance, drum and have fellowship at Lake Gosaikunda (4312 m) for the August full moon. One of Nepal’s most famous religious places of pilgrimage is Gosainkunda lake situated at an altitude of about 4312 m. Surrounded by high mountains on the north and east, this lake is grand and picturesque. Every year during Janai Purnima in August, thousands of Hindu pilgrims come here for pilgrimage resulting in an epic scene. The large rock in the center of the lake is said to be the remains of a Shiva shrine and it is also claimed that channel carries water from the lake directly to the tank at the Kumbheshwar Temple in Patan, 60 km to the south. Buddhists, Hindus, and Shamans (“Dhami”) come from all over Nepal arrive to the lake and on full moon night. There is much dancing and singing. This day is considered holy by the shamans whereby apprentices or “Jhankris” graduate into full shamans. Peak views: Langtang (23771 ft.), Dorje Lakpa (22929 ft.), Loen Pogang (23238 ft.), Phurbi Ghyachu (21844 ft.). From Ghopte; Annapurna, Himalchuli, Manaslu, Ganesh Himal. Ethnic groups/tribes: Sherpa, Tamang, Brahmin, Chettri.